Dull, an app for iPhone that makes it easy to endlessly consume content, today launched an update to gamify online surfing when you’re bored. 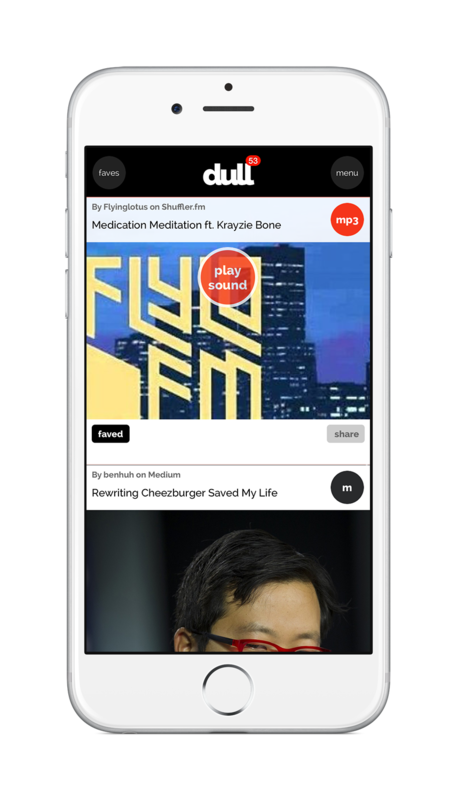 The app makes it easy to subscribe to streams of things that are interesting to you — think GIFs, news stories, funny videos, music — and scroll through them endlessly. In essence, it hopes to be the place you go every time you’re bored and killing time. As you’re shown content, you can swipe left to dismiss or swipe right to share it with friends. Dull launched late last year on Product Hunt and reached 100,000 swipe lefts in just two weeks. The service integrates with tons of third party products so users are able to get the latest from sites like Product Hunt, Reddit, Flickr, 500px, Vine, YouTube and even The Next Web. Using the app for even a little while shows that Dull makes it easy to lose yourself in in viewing, and is a fun way to snap you out of your lethargy. Dull’s latest update is available for free, from the App Store.